The former chief of MI6 has been giving evidence at the inquest into the death of Diana, Princess of Wales at London's Royal Courts of Justice. 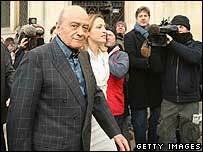 It was never going to be the pantomime the jury saw earlier this week when Mohammed Al Fayed took to the stand. 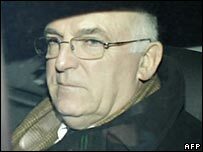 But the stream of allegations from the Harrods boss - including claims MI6 had assassinated Princess Diana on the orders of the Duke of Edinburgh - was the very reason Sir Richard Dearlove had come out of the shadows and into the spotlight of Court 73. As director of MI6 operations on the night in 1997 when Diana, Mr Al Fayed's son Dodi and driver Henri Paul were killed in a car crash in Paris, Sir Richard admitted the allegations were personal and that he was there to deny them. Plain-clothes policemen were spotted by the court's security staff, but there was none of the fanfare of Mr Al Fayed's arrival. From the outset, it was clear Sir Richard - who went on to serve as head of the agency from 1999 to 2004 - intended to deliver his evidence precisely, with pithy answers, and that he did not want to veer into out-of-bounds territory. Asked about MI6 policy on responding to public allegations, he said: "In the interests of national security, the better choice is to say nothing." Among the public, there may have been an appetite for a glimpse into the workings of MI6, or at the man once known in Whitehall as "C", but Sir Richard began by giving little away. The regular clearing of his throat may have hinted at nerves, or just as likely a lingering cold. Perhaps he feared too long spent out of the job would put him at a disadvantage. Dressed in a black suit and grey tie, he told how he had progressed through the ranks of the Secret Intelligence Service before retiring in 2004 to become Master of Pembroke College, Cambridge. With his white hair and delicate spectacles, he could just as easily be imagined in a Cambridge gown as leading MI6. Sir Richard, 63, sketched out his role as director of operations from 1994-9. He said he had responsibility for all significant plans, including those requiring the highest level of clearance. He described "very strict managerial control" and explained any significant proposal would be discussed with the chief of MI6 who he saw daily, before being signed off by the foreign secretary. Vetting procedures were "draconian" and the personal integrity of staff was paramount, he said. At times Sir Richard kept strictly to the line of questioning. Asked whether MI6 was stationed in Paris, he said: "I think we can acknowledge that." Ian Burnett QC, representing the coroner, replied: "I do not think the world will stop rotating with that one, Sir Richard." During questioning, it emerged that Sir Richard had been in the US on 31 August 1997 when Diana died, but had been in telephone contact with colleagues. Choosing his words carefully, he went on to deny Mr Al Fayed's allegations one by one. Asked whether the French police and French medics had played a part in the princess's death, Sir Richard said it was a "mischievous and fanciful allegation". He allowed himself a wry smile when asked if Prince Philip was in a position to direct MI6 operationally from Balmoral castle. When it came to the claim that MI6 was running the country, he admitted being tempted to say he was flattered. Instead, he said: "It's such an absurd allegation. It's completely off the map." Michael Mansfield QC, representing Mohammed Al Fayed, began his cross-examination by making clear his intentions for full answers. "Sometimes weasel words are used so that unless you ask the right questions, you don't get the answer," he said. On their return from lunch, it had become a battle of wits and intellect. Mr Mansfield pursued a line of questioning about MI6's use of SAS cells to carry out assassinations. He also asked whether Diana's interest in landmines in Angola and Mohammed Al Fayed's immigration status were being more closely followed by MI6. Laughing off the accusations, Sir Richard said: "I'm sorry to disappoint you, but they were of no interest whatsoever." For MI6, the interrogation is far from over. Other MI6 employees are due to give evidence from 26 March. This time, though, they will be identified only by letters or numbers, and will give evidence out of view of the public and media.